Tom Kurzanski (born April 8, 1979) is a comic book artist in Denver, Colorado. His artistic body of work includes Karma Incorporated published by Viper Comics, a retelling of Antigone from Silent Devil Productions, and short stories including Heart Mountain, WY: 1942 from Josh Howard Presents: Sasquatch and the League of Professional Jealousy from Tales of the Middle Man. He illustrated the 2010-2012 webcomic and successful Kickstarter project called Post Apocalyptic Nick for the Webcomic Factory, written by Christian Beranek and Tony DiGerolamo. Karma Incorporated is a three issue comic book limited series about a team of misfits who are paid to cause trouble with the enemies of their employers. The series is written by David Hopkins, illustrated by Tom Kurzanski, colored by Marlena Hall, and published by Viper Comics. The first issue debuted at the San Diego Comic Con in July 2005, and was released on a monthly basis thereafter. Viper Comics, based in Dallas, Texas, has been an independent publisher of comic books and graphic novel trade paperbacks since 2003. Viper comic books are distributed by Diamond Comic Distributors and their graphic novels are distributed through Diamond, Ingram Books, Baker & Taylor, Inc., and other distributors. Christian Beranek (born August 23, 1974) is a United States writer, actress, musician and film/TV producer. Apocalyptic and post-apocalyptic fiction is a subgenre of science fiction, science fantasy or horror in which the Earth's technological civilization is collapsing or has collapsed. The apocalypse event may be climatic, such as runaway climate change; natural, such as an impact event; man-made, such as nuclear holocaust or resource depletion; medical, such as a pandemic, whether natural or man-made; eschatological, such as the Last Judgment, Second Coming or Ragnarök; or imaginative, such as a zombie apocalypse, cybernetic revolt, technological singularity, dysgenics or alien invasion. The story may involve attempts to prevent an apocalypse event, deal with the impact and consequences of the event itself, or it may be post-apocalyptic, set after the event. 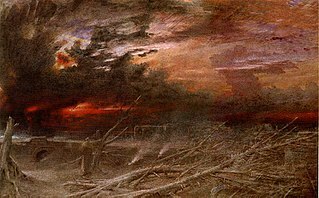 The time frame may be immediately after the catastrophe, focusing on the travails or psychology of survivors, the way to maintain the human race alive and together as one, or considerably later, often including the theme that the existence of pre-catastrophe civilization has been forgotten. Post-apocalyptic stories often take place in a non-technological future world or a world where only scattered elements of society and technology remain. Webcomics are comics published on a website or mobile app. While many are published exclusively on the web, others are also published in magazines, newspapers or in comic books. Dinosaur Comics is a constrained webcomic by Canadian writer Ryan North. It is also known as "Qwantz", after the site's domain name, "qwantz.com". The first comic was posted on February 1, 2003, although there were earlier prototypes. Dinosaur Comics has also been printed in three collections and in a number of newspapers. The comic centers on three main characters, T-Rex, Utahraptor and Dromiceiomimus. Joey Manley (1965–2013) was an American LGBT fiction author, web designer, and webcomics publisher. Manley wrote the successful LGBT novel The Death of Donna-May Dean in 1992. He moved to San Francisco in 2000 in order to work in web design. Manley was the founder and publisher of the Modern Tales family of webcomics websites, which included Modern Tales, Serializer, Girlamatic, Webcomics Nation, and others. Manley is considered one of the "founding pioneers" of the webcomic movement for creating a then-revolutionary subscription model. Serializer.net was a webcomic subscription service and artist collective founded by Joey Manley and edited by Tom Hart the existed from 2002 to 2013. Designed to showcase artistic alternative webcomics using the unique nature of the medium, the works on Serializer.net were described as "high art" and "avant-garde". The project became inactive in 2007 and closed alongside Manley's other websites in 2013. Nick Sagan is an American novelist and screenwriter. He is the author of the science fiction novels Idlewild, Edenborn, and Everfree, and his screen credits include episodes of Star Trek: The Next Generation and Star Trek: Voyager. He is the son of astronomer Carl Sagan and artist and writer Linda Salzman. Patrick Sean Farley is a freelance illustrator and Web page designer. Known as a pioneer of webcomics as a medium, Farley works out of Oakland, California. The American Crusader is a fictional character, a superhero who originally appeared in Thrilling Comics #19. The character was revived in the Modern Age in Femforce #59, by AC Comics, and in Tom Strong #11, by Alan Moore and Chris Sprouse. Webcomics Nation was a webcomic hosting and automation service launched on July 29, 2005 by Joey Manley. David Hopkins is an American comic book writer and essayist. His works include Karma Incorporated and Emily Edison from publisher Viper Comics, Astronaut Dad, and a comic book adaptation of Antigone with frequent collaborator artist Tom Kurzanski. He writes a regular comic feature for D Magazine called Souvenir of Dallas with artist Paul Milligan. David is a contributor to the Smart Pop Series from BenBella Books. He is the co-host and co-producer of Fanboy Radio's Indie Show, that showcases independent and small press comics. David lives in Arlington, Texas with his daughter Kennedy. 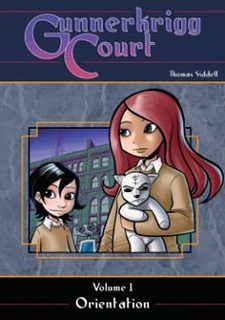 Gunnerkrigg Court is a science-fantasy webcomic created by Tom Siddell and launched in April 2005. It is updated online three days a week, and the first volume of the comic was published in print format by Archaia Studios Press and Titan Books. The comic has been critically acclaimed and has won numerous Web Cartoonists' Choice Awards, as well as receiving positive reviews for its artwork and storytelling. Tony DiGerolamo is a comic book writer and screenwriter from New Jersey. FreakAngels is a post-apocalyptic webcomic created in 2008 by Eagle Award-winning writer Warren Ellis and artist Paul Duffield, and published in book format by Avatar Press. The plot focuses on twelve 23-year-old psychics living in Whitechapel six years after civilization in Great Britain is destroyed. The webcomic has received various awards and have been collected in a series of six volumes. Nick Harkaway is a British novelist and commentator. He is the author of the novels The Gone-Away World, Angelmaker, Tigerman, and Gnomon; and a non-fiction study of the digital world, The Blind Giant: Being Human in a Digital World. Minna Sundberg is a Swedish-speaking Finnish illustrator and cartoonist born in Sweden. She is known for the webcomics A Redtail's Dream and Stand Still, Stay Silent. The history of webcomics follows the advances of technology, art, and business of comics on the Internet. The first comics were shared through the Internet in the mid-1980s. Some early webcomics were derivatives from print comics, but when the World Wide Web became widely popular in the mid-1990s, more people started creating comics exclusively for this medium. By the year 2000, various webcomic creators were financially successful and webcomics became more artistically recognized. Stand Still, Stay Silent is a Finnish-Swedish webcomic started by Minna Sundberg in 2013. Set in post-apocalyptic Scandinavia, the webcomic incorporates Nordic mythology, focusing on an adventure into the external "silent world". Reviewers have praised it for its beautiful visuals and cartography. It received a Reuben Award in the "Online Long Form" category in 2015. Rapture Rejects is a top-down battle royale developed by Galvanic Games and Explosm Games. Rapture Rejects was released on Microsoft Windows in 2018.